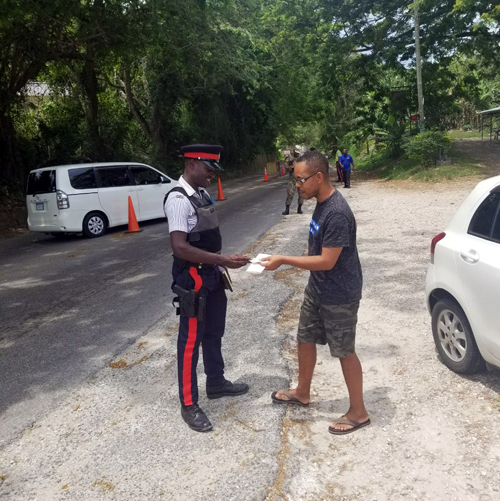 The State of Emergency operating in St. James is having a positive effect on surrounding parishes. Hanover, Trelawny and Westmoreland have been bolstered by these additional security measures as most of the traffic that comes out of St James, Montego Bay, in particular, has to undergo three checkpoints, one in Great River, one in Montpelier and the other at Wilshire. These checkpoints have not only curbed the flow of guns, but it has also sought to hamper the movements of migrant criminals from one community to the other. The effect of these checkpoints has also impacted the lotto scammers in that they cannot move around money as freely as they would like. I am not saying that these criminal elements don’t continue to do these things, but I am saying that these checkpoints have seriously stopped or slowed these movements and should be made permanent. I don’t think there is any legal impediment to that. We cannot allow our parish borders to be left open again. If we do so, the State of Emergency will have failed to accomplish anything and things will go back to how they were. The State of Emergency is not the cure for crime and many persons are misguided in their expectations. What it has done is stabilize, and that’s in response to rampant criminality, including murders and shootings. Jamaica is engaged in any war b. There is in force a proclamation by the governor general declaring that a state of public emergency exists c. There is in force a resolution of each House supported by the votes of a majority of all the members of that House declaring that democratic institutions in Jamaica are threatened by subversion. When can it be declared? 1. When a state of war between Jamaica and a foreign state is imminent 2. As a result of the occurrence of any earthquake, hurricane, flood, fire, outbreak of pestilence, outbreak of infectious disease, or other calamity 3. When action has been taken or is immediately threatened by any person on such an extensive scale, it could likely endanger the public safety or deprive the community, or any substantial portion of the community of supplies or services essential to life. What does it mean? Extraordinary powers have been given to the security forces 2. Some rights have been suspended. Members of the security forces may search places without a warrant. The proclamation shall remain in force for a period of one month unless extended by the House of Representatives or revoked. With that being said, it’s sad to see the lack of resources facing the soldiers/police at the Great River checkpoint. At nights, they have no overhead floodlights and they have few or no flashlights to conduct searches. There is only a small white tent that is present and whenever it rains, the officers cannot carry out their functions properly. I see the police officers with no raincoats and I would expect that for an operation that is expected to last this long, they would have had in place temporary sanitary facilities and I am not seeing this. I must, however, commend the police and soldiers who are doing a great work under the trying circumstances. It is for the hierarchy of the security forces to step up and give the officers the tools needed to work effectively. Whilst I seriously doubt that the State of Emergency will be extended further, I would very much like for the border checkpoints to remain. They are serving a great purpose. Enough said.